Proposed fares for the new CTrail Hartford line service were released earlier today. We have not had much time to study the fare offering but it would appear that the proposed fares are basically in-line with fares on CTrail’s Shoreline East service and Metro-North’s intra-state (CT) service. Public Hearings to review and discuss the new proposed fares will be held in New Haven, Hartford, and Springfield over the next few weeks. Here’s a quick recap of the Knowledge Corridor Transportation Conference that was held at Springfield Union Station last week. The highlight of the event was the speech by Connecticut Governor Dannel Malloy. “Quite frankly, one of the things Massachusetts needs to do is get a rail line between Boston and Springfield to connect to the rail line we are building in Connecticut,” Malloy said to applause from the 300 or so people in the audience at the conference. Malloy has long been a strong advocate in his state and our region for expanded and improved public transportation. One only has to look at the success of the CTFastrak bus rapid transit system and the coming CTrail Hartford Line rail service to know that Connecticut is focused on the future. The video recording of the conference is just over three hours long so we’ve created a list of “start points” so that you can jump to sections that might interest you. Anyone interested in the future of transportation in our region is encouraged to have a look at the video. Conferences like this, with speakers like this, are few and far between. On October 17th Sen. Eric Lesser launch a website highlighting stories that have been submitted to his office in support of passenger rail service between Springfield and Boston. On Tuesday morning at 7.30 am a chartered bus will be departing from Springfield for the Statehouse in Boston. The bus, which is being sponsored by Sen. Lesser’s office, will be transporting people from our region who will offer testimony before a hearing of the Joint Legislative Committee on Transportation. If you are not planing to attend the hearing — but you wish to offer testimony in support of Springfield-Boston rail service — please send your testimony to Samantha.Kelly@MAsenate.gov. Samantha Kelly is Sen. Lesser’s legislative aide. She will see that it finds its way to the committee. 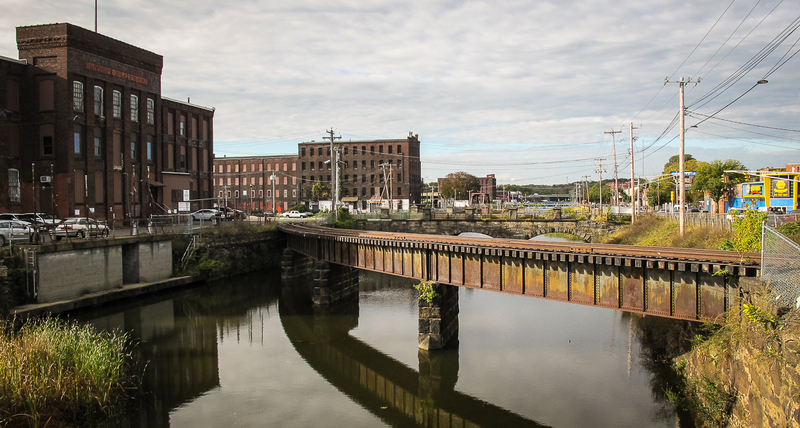 Earlier this month the Massachusetts Department of Transportation (MassDOT) announced that it had awarded the Pioneer Valley Railroad a grant of $495,000 to assist with the cost to repair of an out-of-service rail bridge in downtown Holyoke. The grant was one of eight recent grant awards made under MassDOT’s Industrial Rail Access Program. The Pioneer Valley Railroad operates a network of rail lines in Holyoke and Westfield. The open deck bridge that will undergo repair, which is shown in the image above, will have both steel and masonry work performed on the structure. The re-opening of this bridge, which was last used in 2013, will allow the Pioneer Valley Railroad to interchange freight rail cars with the Pan Am Southern railroad company which operates the north-south rail line through Holyoke. The re-opening of the interchange with Pan Am Southern should allow some freight rail customers on Pioneer Valley’s rail network to improve the routing of certain rail cars to and from other rail networks, e.g., Norfolk Southern and railroads in Canada. It has been reported that the turnout on the New England Central Railroad’s Main Line that allows rail traffic to diverge (to the right in the image above) onto the MassDOT owned Connecticut River Main Line has been replaced. The report, which appears in the caption attached in this image, indicates that a new #20 turnout was recently installed at this location. Why does this matter? The short answer is that the turnout at this location has been in need of replacement for some time. Amtrak’s Vermonter all to often in recent years has had to crawl across this switch at speeds as low as 10 mph. The new turnout should allow the Vermonter to pass over this turnout at a speed of 40 mph. 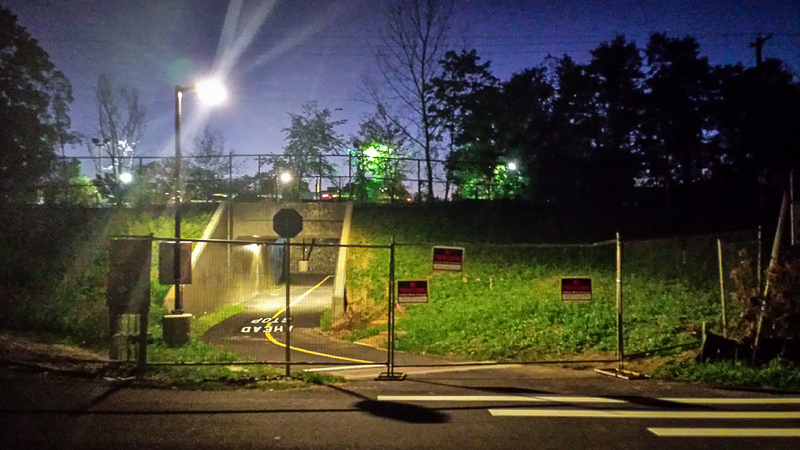 National Grid established electric service at the site of the bike/pedestrian work site a few days ago. From the look of things at the site MassDOT should be ready to take down the temporary fencing and cut the ribbon on this long awaited project very soon.